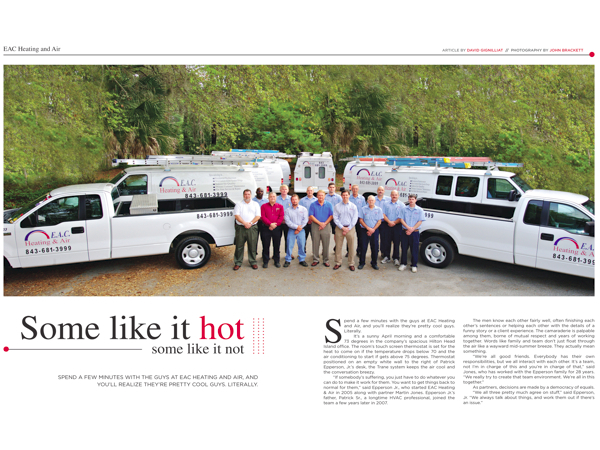 Hilton Head Magazines: CH2/CB2: Some like it HOT. Some like it NOT. Spend a few minutes with the guys at EAC Heating and Air, and you’ll realize they’re pretty cool guys. Literally. It’s a sunny April morning and a comfortable 73 degrees in the company’s spacious Hilton Head Island office. The room’s touch screen thermostat is set for the heat to come on if the temperature drops below 70 and the air conditioning to start if gets above 75 degrees. Thermostat positioned on an empty white wall to the right of Patrick Epperson, Jr.’s desk, the Trane system keeps the air cool and the conversation breezy. “If somebody’s suffering, you just have to do whatever you can do to make it work for them. You want to get things back to normal for them,” said Epperson Jr., who started EAC Heating & Air in 2005 along with partner Martin Jones. Epperson Jr.’s father, Patrick Sr., a longtime HVAC professional, joined the team a few years later in 2007. The men know each other fairly well, often finishing each other’s sentences or helping each other with the details of a funny story or a client experience. The camaraderie is palpable among them, borne of mutual respect and years of working together. Words like family and team don’t just float through the air like a wayward mid-summer breeze. They actually mean something. As partners, decisions are made by a democracy of equals. They know their stuff, and when it comes time to get down to business, EAC customers know they are in the hands of true professionals. In fact, that means sometimes giving clients honest, straightforward advice when they could have just replaced a whole system. Client satisfaction means having an eye for detail, and asking the right questions. EAC divides its business between residential replacement units, new construction, and service contracts and prides itself on a thorough, consistent approach. The EAC family includes several highly-trained technicians and an office support staff that, like the owners, love coming to work every day. Martin Jones, Patrick Epperson, Sr. and Patrick Epperson, Jr.
Wanda Hubbell and her husband Mike had two air conditioning units installed in their Forest Beach condo about three years ago. Wanda had known Epperson Jr. as an acquaintance, and she was intrigued when she learned he was in the heating and air business. After doing a little research, Wanda had EAC Heating & Air come out for an estimate. The Hubbells live in Waynesville, Ohio six months out the year, so it was important that she could find someone reliable to do the job. She’s been extremely pleased with the work, follow-up and customer service, and would recommend EAC without reservation. Epperson Sr. recalls another customer a few years back who was having a real difficult time with allergens in her home. The situation had turned so hopeless that the customer had put her Port Royal home on the market and was planning to move south to Florida. That type of “do-what-needs-to-be-done” approach has carried EAC well through a tough economy, as the company has seen its business grow every year, when many of their competitors have struggled or gone out of business. 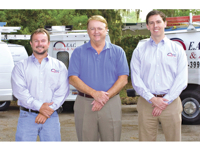 EAC Heating and Air is located at 76 Beach City Rd, Suite A on Hilton Head Island. The company’s service area includes Hilton Head, Bluffton, Okatie, Beaufort, Ridgeland and Hardeeville. For more information, please contact EAC at (843) 681-3999 or online at eacair.com.